Barbara Lynn Ozen was born in 1942 in Beaumont, Texas. She played piano as a child, then switched to guitar,(left-handed). She fell in love with Elvis Presley after seeing him on TV and began styling her hairdo after his. She taught herself guitar playing along to songs on the radio at her grandmother’s house. 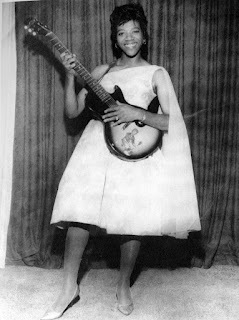 Young Barbara became inspired by artists like Guitar Slim and Jimmy Reed, and learned to pick with her thumb while strumming rhythm with her other four fingers. At junior high she liked Brenda Lee and Connie Francis and formed an all-female band, Bobbie Lynn and Her Idols, and together they won many local talent contests. Soon an underage Lynn snucked off off school to play the local clubs and juke joints. Clarence “Bon Ton” Garlow soon became her mentor, but she was also influenced by Guitar Junior (aka Lonnie Brooks). Lynn used many of her school poems as lyrics for her blues songs and quickly accrued a wealth of original material. When she left high school she started to tour the South, and at a gig at the Palomino Lounge in Louisiana, Joe Barry spotted her and introduced her to his manager, Huey P. Meaux (aka Crazy Cajun). Meaux approached her parents to ask permission to take her to New Orleans to record at Cosimo Matassa’s studio. Her parents were reluctant at first, but eventually conceded on the proviso she gave up professional singing if the first or second record failed to chart. Lynn cut a few singles for the Jamie label including "You'll Lose a Good Thing" (co-written by Lynn and Meaux), with Mac Rebennack (Dr. John) as one of the session musicians. It became a national hit bumped Ray Charles‘s “I Can’t Stop Loving You” out of the No. 1 slot on the R&B charts while peaking at No. 8 in pop. Her first album (of the same name) was also released that year and featured ten of her originals among its 12 tracks. Barbara Lynn now 20 and accompanied by her mother went on tour as an opening act with the Jackie Wilson Show. Soon Lynn was touring with such soul musicians as Gladys Knight, Stevie Wonder, Little Eva, Smokey Robinson, Dionne Warwick, Sam Cooke, Otis Redding, James Brown, Al Green, Carla Thomas, Marvin Gaye, Ike and Tina Turner, the Temptations, and B.B. King. She appeared at the Apollo Theatre, and twice on American Bandstand. She continued to write and record for Jamie up until 1965, producing "You're Gonna Need Me" and "Oh Baby (We Got a Good Thing Goin')." The song was later recorded by the Rolling Stones in 1965. Lynn often left guitar playing to others in the studio which allowed her to concentrated on her vocals. On tour however, she both sang and played. In 1966, Lynn switched over to Meaux's Tribe label and cut "You Left the Water Running," which became something of an R&B standard and was covered by the likes of Otis Redding. She signed with Atlantic in 1967 and was encouraged to play down her swamp roots and sing straight-up soul instead. She had two hits "This Is the Thanks I Get" (1968) and “(Until Then) I’ll Suffer” (1971), before retiring from the music business to bring up her family in California in 1975. She did keep an interest and played the occasional gig at local clubs, and released several singles on Jetstream and other small labels. After her second husband died in the late ’80s, and with her children fully grown, she returned to Beaumont, Texas and resumed her career on a smaller scale while taking care of her mother. She toured Japan in 1984, and recorded a live album, “You Don't Have to Go.” During the 90’s Lynn undertook international tours, to Europe and elsewhere. In 1994, she recorded her first studio album for over twenty years, “So Good.” “Until Then I'll Suffer,” followed in 1996. In 2000, she released “Hot Night Tonight,” which featured her son, rapping on a couple of tracks.